Is that a comic book based on the movie included? Just saw the trailer for the Dora movie, and yeah if they can put all those tombs, temples and puzzles from what it looks to be a low-budget production (like around 50M or even less) AND look not half bad, so can a possible Tomb Raider sequel with a slightly higher one. I just finished rewatching the movie again for its anniversary, and oh my word, I want a sequel sooooooooo badly. I can’t get enough of Alicia as Lara, and the ending always makes me so excited for what could be next. Brought to you by HDZeta from China, hoping to grab a copy! Dora movie looks trash, I will never watch it. Yeah, it looks awful and is obviously not aimed at my demographic (UK adult with no kids!). BUT the temples and jungle settings do look kinda cool, if not a bit low-budget TV... You get what i'm saying. "Well, this is a tomb . . . i'll make them feel at home!" 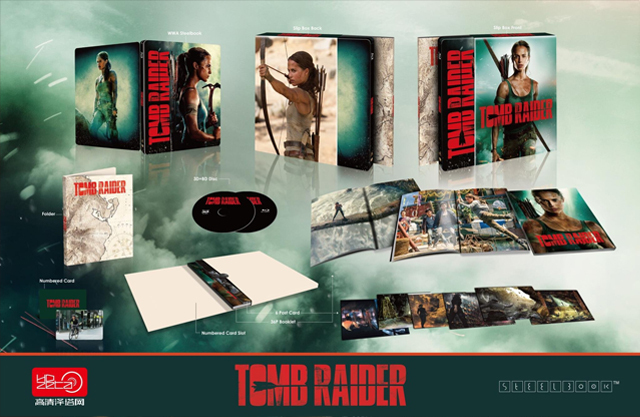 Still, When watching the trailer I was quite surprised and a bit saddened to see this movie having bigger and more interesting tombs and ruins than the latest TR movie. If they make another TR movie they need to step up significantly in that department. Ehh, these tombs look very cartoony to me. Like they're what I would think a kid thinks a tomb looks like. Very shiny, polished and almost comically grandoise. Obviously this makes sense for Dora but I don't think it would work for Tomb Raider. I prefer older looking, damaged ruins. I only play for sic parvis magna. Well, at least it's proof that RotTR's outfit can work well in a movie? I just have received 57 pages of the original Lara Croft : Tomb Raider 2001 screenplay it start in Venice and end before Powell's ellite start to attack the Croft Manor. A place full of drama queens, tiring and exausting but also with good sides. Last edited by Ellioft; 26-03-19 at 07:36.